Michael Vaughan has confirmed at a press conference in Edgbaston that he is to retire from all forms of professional cricket with immediate effect. He departs the international scene as England's most successful Test captain of all time - with 26 wins from his 51 matches in charge. His achievements also include leading England to their first Ashes victory against Australia for 18 years in 2005; a first Test series win in South Africa for forty years - also in 2005 - and presiding over eight consecutive Test wins in 2004. As a batsman, he scored 18 Test hundreds for England following his debut in 1999 and was ranked the number one batsman in the world following the 2002-03 Ashes in Australia in which he made 633 runs including three centuries. Vaughan said: "After a great deal of consideration, I've decided that now is the right time to retire from cricket. It has been an enormous privilege to have played for and captained my country and this is one of the hardest decisions I have had to make." Vaughan added that he reached his decision two weeks ago during Yorkshire's County Championship fixture against Worcestershire at New Road, when he realised that he was starting to hold back the younger players in the Yorkshire dressing-room. "Senior players have to be enthusiastic and I wasn't that passing on," he said. "I want to give them the chance to play first-class cricket and go on to play for their country." "Playing cricket has been my life for 16-17 years, so to hand it over without a chance to play again is hard," he said. "I've given it my best shot, I wanted to give it one last hard effort to get into the Ashes squad, but I haven't been playing well enough and my body hasn't been holding up. But this is where my life starts, so it's an exciting time for me." "I'd like to record my sincere thanks to the England fans and the ECB and the members and supporters of Yorkshire County Cricket Club for their unstinting backing throughout my career as well as my wife Nicola and the rest of my family who have been equally supportive." "I'm also extremely grateful to all of the players, managers, coaches, media and administrators I've worked with, who have all contributed to making my career so enjoyable and fulfilling. "I'd also like to wish Andrew Strauss and the current England team success in this Ashes series. I know they have the drive, ambition and abilities to repeat the success from 2005. Winning that series was most definitely the highpoint of my career, because we not only won the series, but captured the nation, which cricket hasn't done for a long, long time." "I want to be remembered as a nice player on the eye to watch, and as someone who gave my all. I leave with no regrets. I captained with an instinctive nature and I was fortunate to lead a determined team that played with an aggressive style." Commenting on his decision, ECB chief executive David Collier said: "Everyone associated with cricket in England and Wales will be forever grateful to Michael Vaughan for his immense contribution to the England team's success. His achievement in leading England to victory against the number one ranked team in the world, Australia in 2005, was arguably the finest by any England captain in the modern era." Hugh Morris, the managing director of England cricket, said: "As an international captain Michael ranks among the very best and the way in which he and Duncan Fletcher forged a team capable of winning six consecutive Test series stands as testament to his ability to inspire and motivate those around him. "He was also a marvellous ambassador for England cricket off-the-field as well as on it and someone who genuinely appreciated the generous support he received from the thousands of England supporters who follow the team at home and abroad. No-one who saw his magnificent hundreds in Australia in 2002-03 will forget the contribution he made to the team as a batsman either - he will be rightly remembered as a player of the highest class." England's captain, Andrew Strauss said: "I count Michael as a good friend as well as a team-mate and I know what a tough decision this will have been for him as he took so much pleasure and pride in representing his country. "I learned a great deal from watching him captain the side for five years at close hand and his ability to identify a new strategy for outwitting the opposition or bring the best out of his own players was a priceless asset. "But more than anything we as players will miss the enormous sense of fun and enjoyment that Michael brought to the dressing room. He will be missed by everyone connected with the team and we wish him every success in his future career." 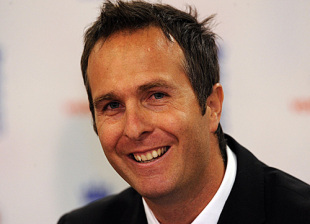 Yorkshire's chief executive, Stewart Regan, said: "Michael Vaughan is a class act and will be remembered by Yorkshire members and supporters around the world for his beautiful stroke play and of course his success in leading England to Ashes glory in 2005. "It has been a pleasure and a privilege for me to get to know Michael over the past three years and his presence around the club has been hugely motivational, particularly the younger players. "I wish him every success in the future and hope that he continues to take more than a passing interest in the fortunes of Yorkshire CCC. On behalf of the Board of Directors, I would like to personally thank him for his magnificent contribution not only to Yorkshire but to the game of cricket as a whole."